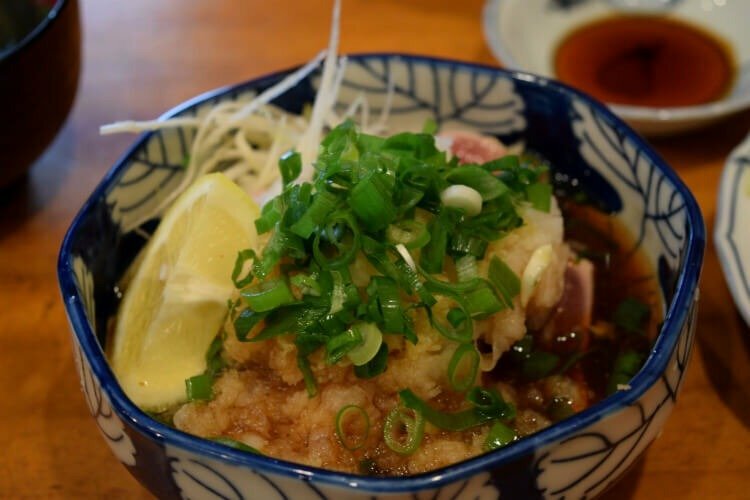 Looking back at all the food we ate in Japan is making me want to look up cheap flights right this very moment. It’s a country I’ve dreamed about visiting since I was a chubby little school kid waking up at 6 AM to watch Sailor Moon and begging my mom to buy me those cute Japanese snacks from the grocery store. Japan was everything I had hoped it would be and the food even more so. 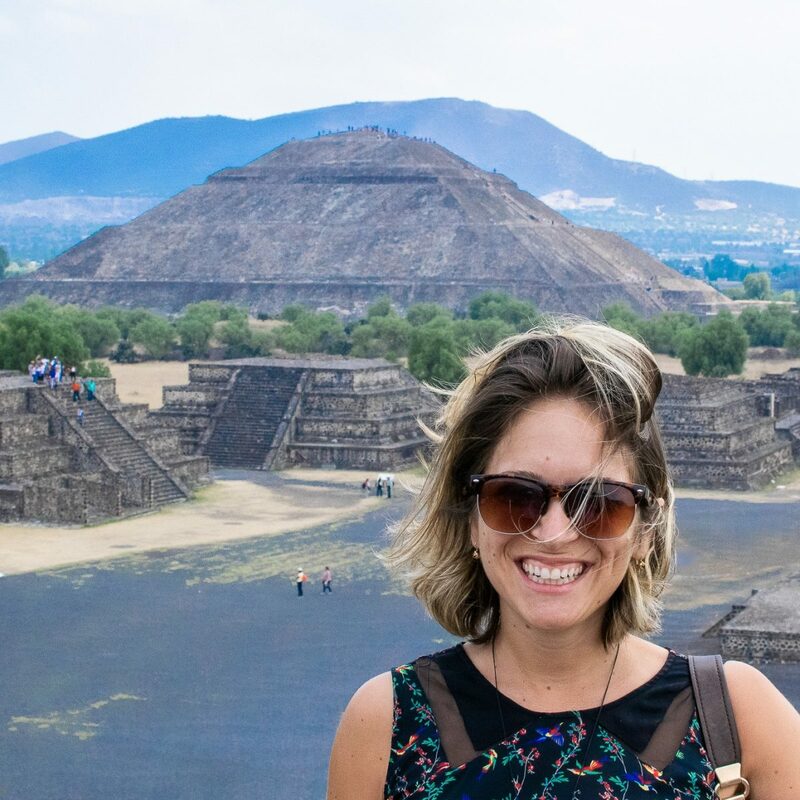 I did a lot of research on what to eat in each city we were visiting so that we didn’t miss any of the local delicacies. I still feel like we only scratched the surface of all there is to eat in this culinary country. Udon, udon, and more udon. We ate it a lot. Mostly for lunch, sometimes for dinner. 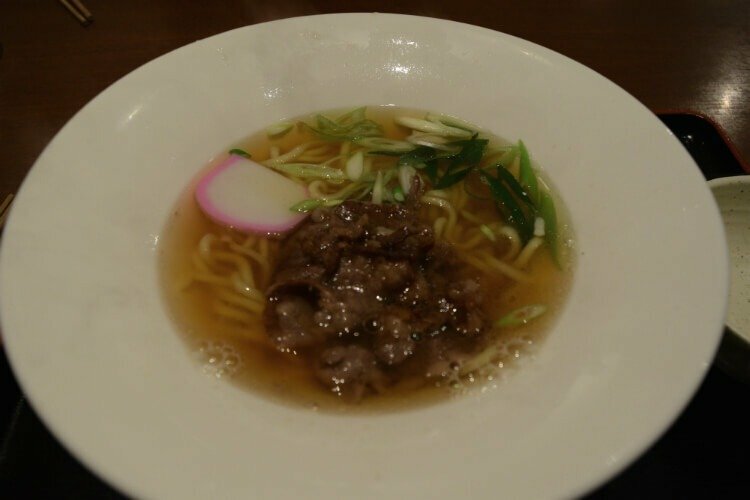 Udon with beef was one of my favorites. We devoured these two in a little spot near our hotel in the outskirts of Hiroshima. Luke had the Tempura udon and I couldn’t stop reaching my chopsticks across the table for one more nibble of those lightly battered delights. Thick udon with two of the biggest pieces of tofu I have ever seen. Udon with raw egg that we swirled around in the bowl. The woman at this little udon shop that we went to was amazing. She kept talking SUPER loud in Japanese to us and laughing – she showed us how to mix the egg in and slurp the noodles (don’t you dare bite noodles in the presence of a Japanese person). 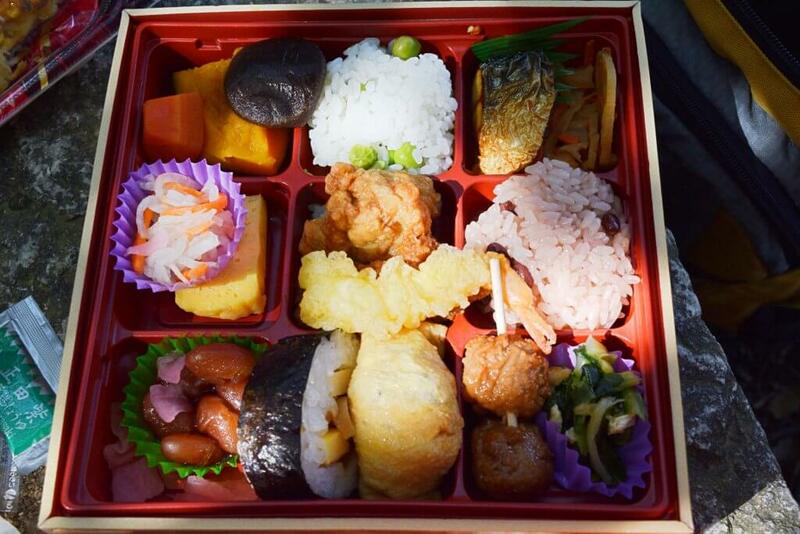 I still dream about all the bento boxes we ate while we were there. They were the perfect budget lunch and a great way to sample a whole lot of different things at once. We would grab a few from the grocery store in the morning and stop somewhere at lunch time to dig in. I loved the tempura, the meatballs and the sticky rice the most. Sometimes they would have these beautifully light potato cakes inside – it was a struggle to share those with each other. 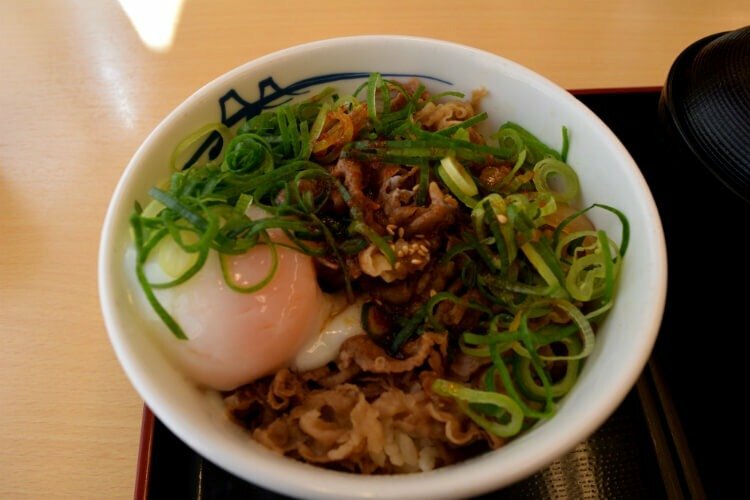 If we saw a gyudon shop like Sukiya or Matsuya, we simply couldn’t walk past. One of the cheapest and most delicious meals. You could have it with just meat and rice or you could add loads of different toppings like eggs, green onions, and heaping scoops of pickled red ginger. An Osaka specialty, isn’t something I thought I would like. 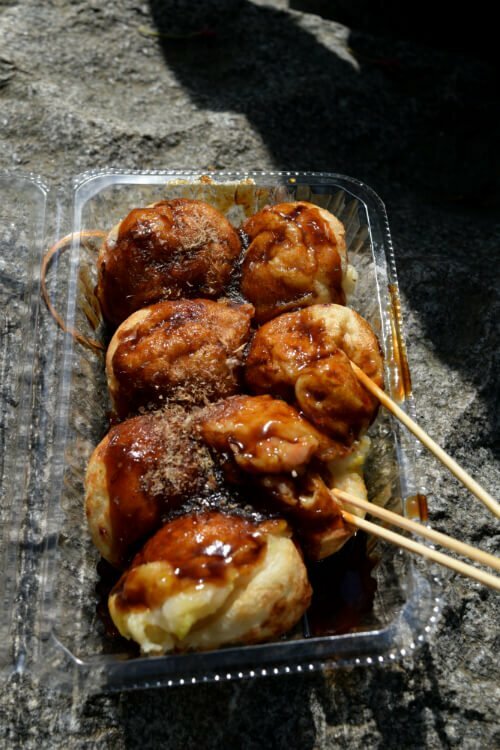 Thick slices of octopus legs dipped in this gooey batter and cooked in little cups on a high heat. Then covered in a thick, salty soy based sauce. The texture was hard to get used to – it’s super runny inside, but on a cold afternoon when the wind was blowing a gale, this tasted oh so good. 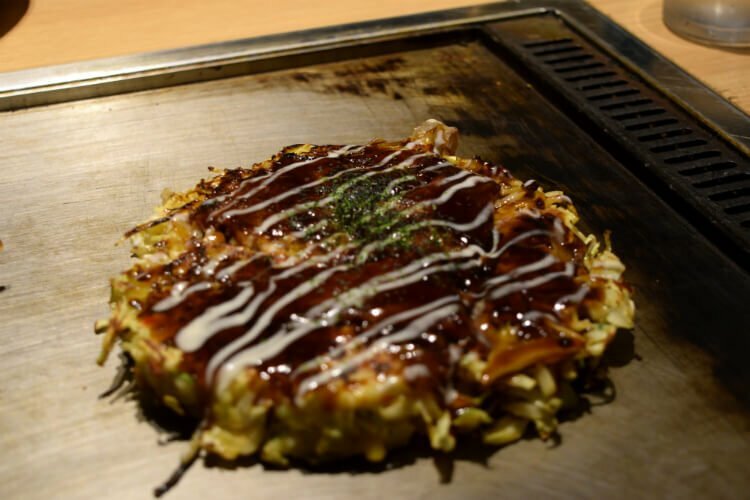 Another Osaka dish, Okonomiyaki is a rich and warming dish. Served as street food or hot on a grill at your table in a restaurant, it’s cabbage and egg covered in pork pieces, soy sauce, mayonaise and anything else leftover in the fridge. Okonomiyaki literally means “grilled as you like” and was born as a creative way to use up those leftovers. Not much else to say – we ate it as often as we could. I actually didn’t really love the fatty tuna. I found the lean tuna to be much tastier. 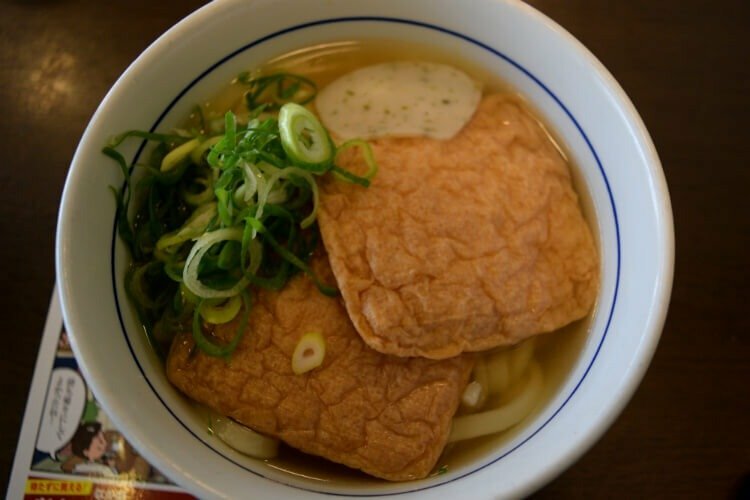 This could very well be one of the most memorable dishes that we ate in Japan. 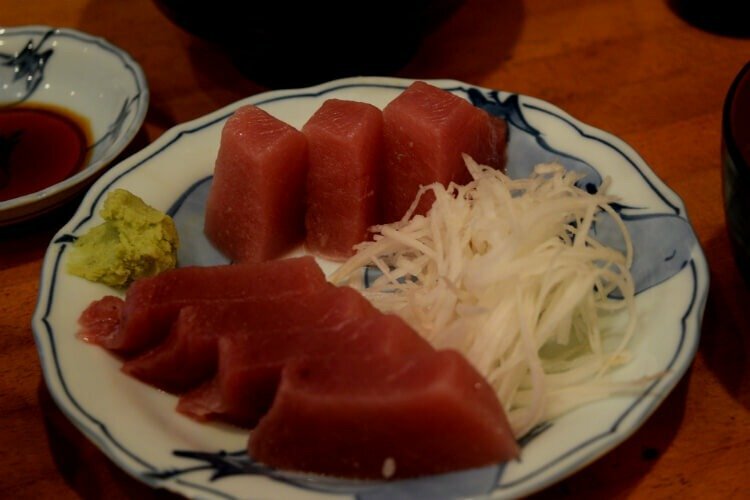 Tucked away on a small street in Nara was this tiny little mom and pop tuna restaurant. It was well after lunch time and it was still busy, a constant stream of people coming in all afternoon. Tataki is seared tuna covered in ginger and lime. We did everything except pick up the bowl and drink this sauce afterwards. It was that good. Chicken skewers of all kinds. 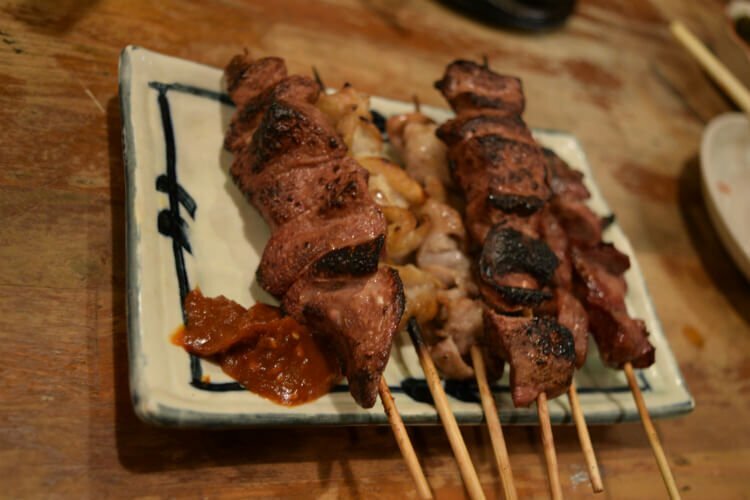 We ate these in a smoke filled bar in Tokyo’s Shinjuku district. Chicken hearts, chicken livers, meatballs and intestines all made the cut. The intestines were a little chewy, but the heart is far more pleasant than I thought it would be. We ate a lot more than this that I was too ravenous to stop to take photos of. There was the dynamite sushi at a sushi bar in Tokyo, there were all those curry udon bowls we ate and fried pork Donkatu covered in thick curry gravy. Sometimes you just have to dig straight in and forget about the camera. What do you think? Have you ever been to Japan? What were your favorites?